I am incredibly honored to be selected as one of eight artists to represent the upper Midwest in the exhibition Sioux City Art Center Selects. A presentation by each artist will focus on the development of their ideas, process, and how that development has translated into artistic and professional success. The Artist Experience culminates in a round-table conversation moderated by Todd Behrens, Curator, Sioux City Art Center, IA. Three of my free-motion embroidered drawings are included in this innovative exhibit featuring artists working in a variety of media and showing a great range of experimentation in the material process. Wangensteen Historical Library of Biology and Medicine, University of MN, Minneapolis. Two of Gustafson’s drawings are featured in the exhibition, The Secret Life of Books. The exhibit is on view from September 2018 through December 2019 and highlights scholars and artists who have used the library’s collection for research and inspiration in their work. Thank you Margo Ashmore for featuring my work in arts INSIGHTS, a page about artists and the Arts at Work by the Northeast Minneapolis Arts District in collaboration with the Northeaster. Excited to have three free-motion embroidered drawings in the upcoming Surface Design Association exhibition, The Art of Labor at the San Jose Museum of Quilts and Textiles. The exhibit is on view from July 22 - October 14, 2018. Opening reception on July 22nd. Beginning December 27, 2017, 50 all-women artist/chef-restaurateur teams met to join forces in an innovative partnership whereby chefs are inspiring the artists to produce new artworks, culminating in the exhibition, Artists in the Kitchen. Recognizing the abundance of local culinary and visual art talent of Twin Cities-area women, “this invitational exhibition forges a new partnership that celebrates the work of women artists in both the art studio and culinary worlds.”— Artists in the Kitchen Organizers. My partner is Jenny Ellenbecker of Round Lake Vineyards and Winery. Jenny and I met over tea to discuss her work as a vintner and owner of Round Lake Vineyards and Winery. Through our conversation, I became engaged with the various growth stages of grapes within a season. I was inspired to further investigate and understand a grapevine’s cycle. 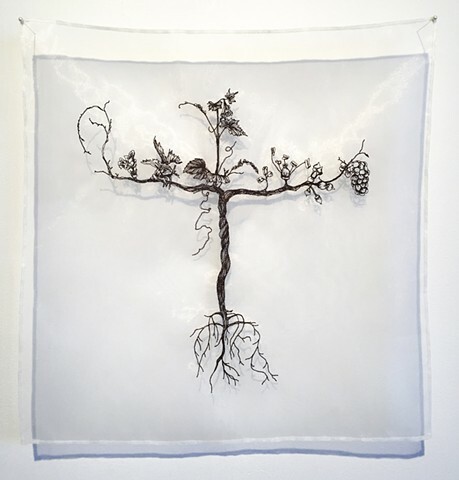 The free-motion embroidered drawing created for Artists in the Kitchen captures and highlights select seasonal changes of grapevines including winter dormancy, to spring budburst, to summer fruit set, and fall harvest. Please join us for the opening reception of Surface|Tension at Bridgewater Lofts in Minneapolis this Thursday, February 15th, from 6 - 8 pm. I'm excited to be included in this exhibition with the following artists: David Baer . Barbara Bend . Laura Hallen. Farida Hughes . Dan Mather . Mary Meuwissen . Kathy Mommsen . Kevin Peters . Robert Jackson . Matthew Rucker . Mary Ann Morgan . and Dan Wein. My full Raw to Processed series will be on exhibit. Embroidered botanical drawings, along with related ancient herbals and domestic recipe books, from the Andersen Horticultural Library and the Wangensteen Historical Library of Biology and Medicine collections, will be on exhibit to commemorate and provide a contemporary perspective on De Materia Medica, an ancient pharmacological text, by Dioscorides. An Artist Talk, open to the public, will provide an overview of how the project evolved and Gustafson’s drawing process. Karen Gustafson is a fiscal year 2017 recipient of an Artist Initiative grant from the Minnesota State Arts Board. 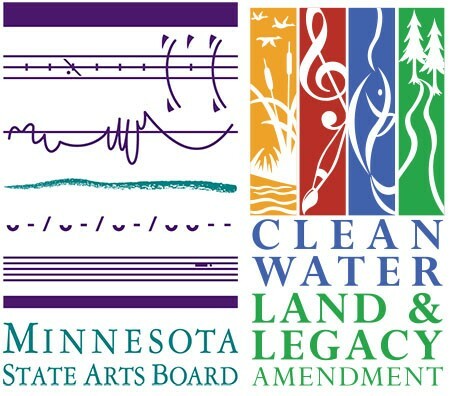 This activity is made possible by the voters of Minnesota through a grant from the Minnesota State Arts Board, thanks to a legislative appropriation from the arts and cultural heritage fund. Excited to be included in the Inaugural virtual exhibition of SciArt Collection Artists. "Li - a concept found in Neo-Confucian Chinese philosophy - refers to the order of nature reflected in its organic forms and patterning. Quite literally, “li” means the markings in jade or the fibers in muscle tissue. We see this patterning in the movement of water, the forms of trees and clouds, the structures of neurons and cells, and in the galaxies of outer space. For our inaugural Collection exhibition the following selected works from SciArt artists have found creative inspiration from li. Our artists explore this elusive yet identifiable organic structuring on micro and macro levels. The natural world and its inherent ability to continually awe, amaze, and inspire the human soul is translated through these incredible works of art." Incredibly honored to be part of SciArt Center's SciArt Collection. They represent select emerging and professional artists that engage scientific ideas through their work. Take a look at the artists represented by SciArt Center based in and around New York City. Thank you to Dr Linda Wolk-Simon, Director and Chief Curator of the Fairfield University Art Museum in Fairfield, Connecticut, for selecting my work to be included in the 2016 SPUN Fiber Exhibit held at the NEST Arts Factory Gallery in Bridgeport, CT. Sept 10 - Oct 3, 2016. Thank you to Himmelfarb Gallery and the Maryland University of Integrative Health's Integrating Health: A Wellness Blog for this thoughtful article on my Raw to Processed exhibition! The "Raw to Processed" series is in a solo exhibition at Himmelfarb Gallery, Maryland University of Integrative Health, Laurel, MD, from June 16 to September 10, 2016. Opening Reception, June 16th from 5 - 7:30 pm. If you are in the area, please join us! I'm excited to have three "Raw to Processed" drawing diptychs included in the TEDxMinneapolisSalon Spring 2016: Reap & Sow on Friday, April 1st, 2016 at The Bachelor Farmer. Reap & Sow focuses on repairing and reestablishing the relationships between food, farming, and the community. Each speaker, artist, and experience at TEDxMinneapolis is inspired by Minnesota's food story, and its impact on our city and the world. In conjunction with the UC Davis Art/Science Fusion program, the Pence unveils the 4th biannual multi-media display of work by thirty-three artists on the fusion of art and science. Juried by Shih-Wen Young, a Sacramento physicist and installation artist, and Sharon Bladholm, a Chicago-based sculptor. The Institute on the Environment presents SUSTAINABLE ACTS, an exhibition devoted to the intersection of the arts and sciences. Awarded an Institute on the Environment mini-grant, and supported by additional contributions, this project continues to explore the conversation between artist and scientist which began 3 yrs ago with the project CONVERSATION-E a dialogue in service for sustainability. I am honored to have one of my "Raw to Processed" drawings (carrot) in this exhibition. Opening Reception: Friday, October 2nd, 5 -7 pm - all welcome! A heartfelt thank you to Alauna Yust of PRX Northern Community Radio for her review of my exhibition at Bemidji State University. Very honored that Lakeland Public Television highlighted my "Intersections" exhibit at Talley Gallery in their "In Focus" series. Many thanks to Mary Kielar for producing the segment! For those in the Bemidji area, my show, "Intersections" is at Talley Gallery, Bemidji State University, until September 24th. A wonderful place to exhibit and a true pleasure meeting so many interesting individuals at the opening. I've included an article BSU posted about the gallery and exhibit. I am pleased to be part of the 3% Conference in Minneapolis on September 9, 2015 as a panel member on "Stoking Your Creativity." "Hear how creative leaders and artists keep their inspiration alive and continually drive themselves to new levels of original thought." Until The 3% Movement came along, only 3% of all U.S. Creative Directors were women. In a world where women influence upwards of 80% of consumer spending and 60% of social media sharing, this is business suicide. Through a mix of content, community and professional development, we've helped raise the number of female CDs to 11% while giving agencies a clear road map of ways to champion female creative talent and leadership. Our movement includes a 2-day annual fall conference, one-day MiniCons in cities around the world, a vibrant online community, a live Super Bowl Tweetup, a student scholarship fund, a business blog and more. Intersections, a solo exhibition featuring drawings from my Music and Raw to Processed series will be on view from August 27th - September 24th, 2015 at Talley Gallery, Bemidji State University. Opening reception and artist talk will take place on Thursday, August 27th from 12 - 3 pm. All are welcome to attend. It would be wonderful to see you! Drawings, resource images, and false colored images from my Raw to Processed series are now part of Wellcome Images, part of Wellcome Trust, London, UK. I am very honored to be included in this incredible collection. "Wellcome Images is one of the Wellcome Library's major visual collections. Part of Wellcome Collection, a major new 30 million public venue developed by the Wellcome Trust, the Library has over 750,000 books and journals, an extensive range of manuscripts, archives and films, and more than 250,000 paintings, prints and drawings. Wellcome Images is one of the world's richest and most unique collections, with themes ranging from medical and social history to contemporary healthcare and biomedical science." I'm excited to have my work in the exhibition entitled, FEAST: pleasure + hunger + ritual curated by Becky Alley, Lexington Art League (LAL) Curator. The exhibit is at the LAL Galleries at the Loudoun House, Lexington, KY. Exhibit is on view from May 22 to August 9, 2015. Opening reception is May 22nd. SciArt Center's virtual exhibition Un-Natural Nature is featured in the journal Issues in Science and Technology. I am honored to have two of my drawings included with several other SciArt Center members who are part of this exhibition. This solo exhibition features my Raw to Processed series, including four new diptychs completed on my recent sabbatical. Fine Arts Gallery, Normandale College, December 11, 2014 - February 13, 2015. Artist Talk: January 22nd at 6 pm. Reception: January 29th, 5:30 - 7 pm. I am honored to have three of my Raw to Processed drawing diptychs included in this virtual exhibition juried by Danielle Kalamaras. Read Danielle Kalamaras' interview regarding my work in SciArt Center's current virtual exhibition, 'Un-Natural Nature' at SciArt in America's blog. Many thanks to MRAC, the Next Step Panelists, and The McKnight Foundation for their support. Thanks to Symbiartic - the Scientific American science-art blog for including me in their list of Science Artists. Two of my music influenced drawings, Dust & Water and Plenty, were in the exhibition, NOISE & whispers at GV Art Gallery in London. "NOISE & whispers considers the fusion of sound, art and science by bringing together the work of over 30 contemporary artists. From the earliest revelation that objects make noise, through to the complex digital sound manipulations of today, artists have embraced new discoveries to create works impossible in previous generations." Curated by sound artist, Martin A. Smith. Three of my Raw to Processed Food series drawings were included in the exhibition About Space/Contemporary Abstraction at the University of Wisconsin, River Falls' 101 Gallery. This three-person exhibition also featured Betsy Byers and Zoe Shulman. I am incredibly honored to have my work featured on the PBS program NYC-ARTS. Thank you to all who had a part in this. Hosts are Philippe de Montebello, former Metropolitan Museum of Art Director, and Paula Zahn, network news veteran. My MN Original video was selected for the 1st arts content sharing initiative by WNET (PBS) in New York. The arts package, including arts and entertainment video segments, was distributed to 25 PBS stations across the nation in the following states: New York, California, Maryland, Oregon, Connecticut, Indiana, Florida, Texas, and Michigan. The segment features an interview with me and footage of my studio and working process. It aired on Twin Cities Public Television’s (tpt) weekly art series, MN Original from June 24, 2012 – July 3, 2012. And online anytime! Art-A-Whirl takes place annually in Northeast Minneapolis, the third weekend of May. This event is free and open to the public. Hope to see you this weekend! Studio #374. If you are unable to attend or prefer an individual showing, please call me 612.360.4275. Art Attack takes place annually in the historic Northrup King Building. Visual artworks of over 300 visual artists will be on display, along with the sounds of a variety of singer/songwriters and composers . Put on your walking shoes and allow plenty of time to explore the 4 floors of the Northrup King Building, talk with the artists, listen to the music and try your hand at an interactive art activity. Hope to see you this weekend! Studio #374.